Let’s have a look at motion blur techniques in Maya. When you render an animation, motion blur gives the effect of movement by blurring objects in your maya scene. You can turn Motion blur on or off for objects in scene. 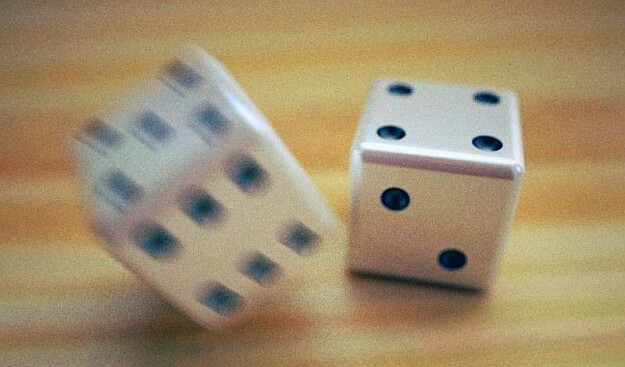 Maya calculates the relationship between the Shutter Angle and Motion blur attributes to determine how much blur is applied to an object in scene. If motion blur is checked, the 3D Motion blur type is enabled as well as Blur by frame. This means that moving objects appear blurred. If it is unchecked, moving objects appear sharp. Motion blur is off by default. The method Maya uses to motion blur objects. 2D motion blur is a post-process; Maya blurs each object in the image after rendering the entire image based on the object’s motion vector (its speed and direction). 3D motion blur is similar to real-world motion blur, but takes longer to render than 2D motion blur. The default setting is 3D. The Shutter Angle can be modified in the Special Effects section of the Camera’s Attribute Editor. Scales the amount that moving objects are blurred.The valid range is 0 to infinity. The default value is 1. 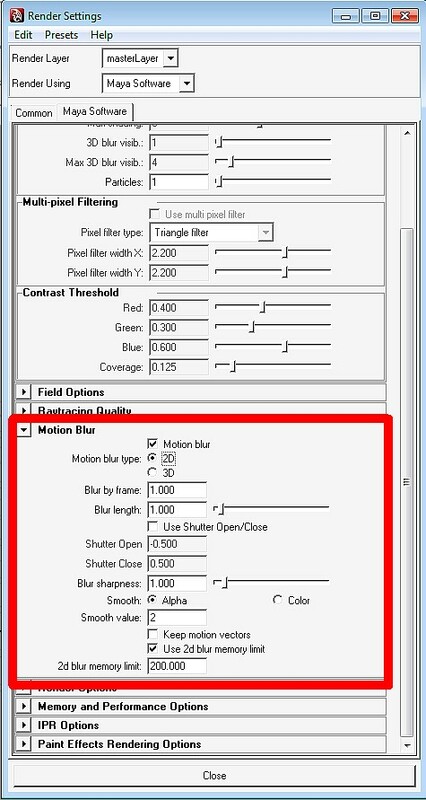 Enable this option to customize the Shutter Open and Shutter Close values. Shuttter open and close values. Default values are -0.5 for Shutter Open and 0.5 for Shutter Close. The Use Shutter Open/Close, Shutter Open and Shutter Close attributes can also be set using the renderGlobals node. The shutter duration cannot be negative. If a user alters the values in the Render Settings window such that the shutter duration is negative, the values will be altered to suit a positive duration. If a negative shutter duration is set on the renderGlobals node, the software renderer will disregard these values and render as if the Shutter Open / Shutter Close values have never been set. This feature is an addition to the motion blur feature. If both Motion Blur and Use Shutter Open/Close are disabled, then motion blur is not used in the render. If Motion Blur is enabled but Use Shutter Open/Close is disabled, then Maya renders with motion blur and with the shutter opening and closing at their default values, which is [-0.5, 0.5]. 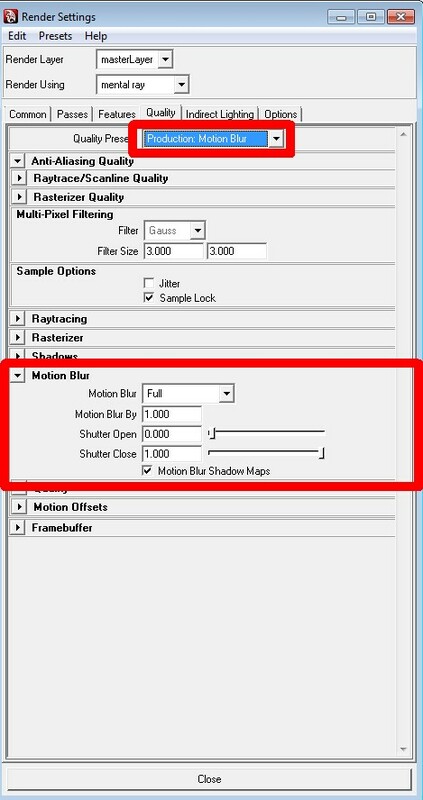 If both Motion Blur and Use Shutter Open/Close are enabled, then Maya will open and close the shutter of the camera at the times you specified. The sharpness of motion blurred objects. The larger the Blur sharpness, the more spread out the blur. The valid range is 0 to infinity. The default value is 1. Sometimes, anti-aliasing performed by the Smooth Value attribute can fail and produce artifacts corresponding to edges in the alpha channel of the unblurred image. For example, when bright opaque objects pass in front of dark light fog. Turning on Alpha or Color in such cases eliminates artifacts by additionally blurring the objects. The amount Maya blurs motion blur edges. The larger the value, the more the motion blur is anti-aliased.The valid range is 0 to infinity. The default value is 2. * Increasing the Smooth value may also blur the edges of static objects, so if you do not want this effect, set Smooth value to 0. * You may not want extra blurring all the time, so only use this attribute when necessary. You can also try setting Smooth value to 0, which results in less anti-aliasing, but that may only be acceptable in some situations. * For objects shaded with the Ramp Shader, 2D motion blur provides better results than 3D motion blur (artifacting), but the Smooth attribute must be set to Color, not Alpha. If on, Maya saves the motion vector information for all visible objects in the rendered image but does not blur the image. This lets you blur the rendered images using the vector data with other 2D blur software (for example blur2d). NoteThis only works for Maya IFF images. If off, Maya blurs the rendered image but does not save the motion vector information. Keep motion vectors is off by default. You can specify the maximum amount of memory used by the 2D blur operation. Maya uses whatever memory is available to finish the 2D blur operation. You can specify the maximum amount of memory the operation uses. If Motion blur is on and the Motion blur type is set to 2D, the Use 2d blur memory limit is on by default and provides a default memory limit of 200 MB. This default limit should be sufficient to eliminate most problems. However, you can specify the size of the memory cap (in MB) in the field provided. In mental ray for Maya, you can choose between No Deformation and Full Motion Blur. Motion Blur in mental ray for Maya blurs everything: shaders, textures, lights, shadows, reflections, refractions, and caustics. The No Deformation mode results in instance motion; shape changes are not considered. The Full Mode additionally exports motion vectors for every vertex of the moving object. Use it to motion blur objects with deforming shape. This mode requires more translation and render time. The No Deformation mode just exports instance motion performed on transform nodes, any shape changes (even linear movements) are not considered. The Shutter Open, Shutter Close setting of the Maya camera determines the actual motion blur path length. You can modify other settings, such as Motion Blur By, to further control the final motion blur calculation. Find these settings in the Motion Blur (in the Render Settings window). A typical application of motion blur is the Export Motion Segments option, which approximates any non-linear movement with a set of linear segments. NoteAny transformation animation (instance translation, rotation etc.) with non-linear properties is not handled by the plug-in (there is no support in mental ray for more than 1 motion transform) but left to mental ray’s built-in procedure to detect common cases of rotations (even pivot rotations) automatically. More complex transformation animation is not supported natively, but may be baked as shape deformation in Maya to be rendered correctly. Next How to set up “Depth of Field” in Maya scene? Can u pls have some tutorial to output a motion vector pass (2d and 3d) from maya mentalray and then take it as a pass and add motion blur using it?? this one is costly in terms of rendertimes when u have lot of geometry and high sampling values.